While Pyrex ovenware in clear glass had been massively successful for nearly 30 years, it was the introduction of the color ware in the 1940s that cemented its place in kitchenware history. It all began with the iconic primary-colored set of four mixing bowls in yellow, green, red, and blue, and took off from there. Over the years, the colors offered were reflections of the tastes of the times. The cheerful early primary colors of the 1940s were soon joined, albeit briefly, by lime green and flamingo pink. The 1950s were rounded out by turquoise, pink, and pale yellow. The 1960s first brought warmer tones and pastels like Sandalwood and Early American, suceeded later in the decade by the brighter colors of Daisy. The popularity of avocado greens in the late '60s was reflected in Verde. Primary color mixing bowls were described in early advertising as Canary Yellow, Jade Green, Chinese Red, and Robin Egg Blue. The shades of the original orange-red 402 mixing bowl, the later red 402, the red 402 from the Friendship pattern collection, and the red-orange 402 from the 1968 new multi-color 400 set are all slightly different. The exact shades of the green 403 and blue 401 primary color mixing bowls also varied slightly over time. The shades of yellow on the 400 series mixing bowls from the original multi-color, the all-yellow set, and both the Town & Country and the Daisy pattern collections are all noticeably different. Many non-standard colors appeared only on promotional pieces. Metallic decorative patterns apparently did not adhere well to bare opal glass, so they are always seen on applied color finishes, including white. Non-metallic decorative patterns on white bowls usually are on bare opal glass, the Colonial Mist blue on white pattern being an exception. The black color known as charcoal, used for both dishes and applied decoration, was a matte/satin finish and tends to show wear and damage more obviously than others. The Terra color finish was achieved by applying a dark color over a fired-on lighter color, then removing bands of the topmost with a spinning abrasive machine. Being a matte/satin finish, the Terra pattern also shows wear and damage more readily than others. Some pieces were offered as open stock in colors different from that of the same piece when supplied as part of a set. Subtle differences exist in shades of color from one pattern to another. When viewed alone, some shades might appear indistinguishable from others until both are seen side by side. Knowing the differences is important to the collector, lest a piece is purchased thinking it a match to a particular pattern, only to later find otherwise. Only in a handful of cases were the exact same colors used in more than one pattern. Some examples of differences are shown here. 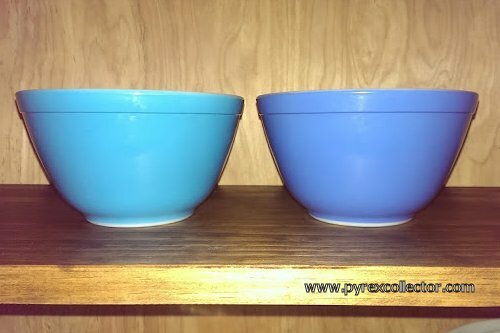 Original Multicolor blue 401 bowl (left) and New Multicolor blue 401 (right). Verde yellow 501 dish (left) and Daisy yellow 501 (right). If you've found a solid color bowl or dish, and are unable to determine to which pattern it belongs, see the Pyrex Solid Color ID Chart. These codes were used in Pyrex distributor catalogs to let readers know the color options for each model pictured. Color suffixes are seen appended to catalog numbers, but should not be confused with pattern numbers, although in some cases the distinction can be somewhat vague. Color numbers are not the same as pattern numbers, which also include some one or two digit numbers. Since some duplication exists between them, each must be viewed in context to determine to what they refer. Pyrex colors can be difficult to discuss without photographs. Avocado to someone else may be olive green to you. One person's gold is perhaps butterscotch to another. And what Pyrex called lime might well have been dubbed honeydew or kiwi by a later generation of marketers. Even with photos, the camera can deceive. 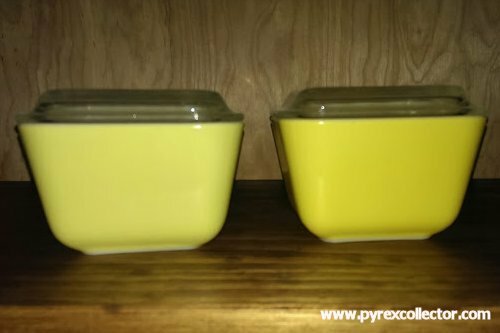 Variations in camera sensors, flash, and ambient lighting can often misrepresent the actual colors of Pyrex pieces. For example, for any given 400 series bowl in yellow there are up to three different shades of that color it could be, and all are very close in appearance until held side by side. For purposes of clarity, shades of colors described on this website will follow the old Crayola crayons convention. Therefore, a color described as orange-red will be more red than orange, and red-orange will be more orange than red.